In order to import data from PowerProject it is necessary within PowerProject to allocate chainages to the relevant tasks and to set up a code base for the different types of tasks. When importing PowerProject must be open with the relevant project active. Start Chainage : Finish Chainage (Note : these must be allocated to Tasks, not Bars). If using a UDF then any string UDF can be used but it must be the same field for all activities and it must not be used for any other purpose. (If you are unsure how to create UDF's in PowerProject then see the topic Creating user-defined fields for your own use in the help file within PowerProject). It is suggested that a string field is created with the same name (e.g. Chainage) for Tasks, Expanded Tasks and Hammocks. Within PowerProject a specific activity code (or series of codes) for use with the Time Location Plus package must be set up, with values for the different types of Task. This will form the basis of the Key Legend for the time location chart. All Tasks (not bars) which are to be imported into the time location chart MUST be allocated a time location package code. Tasks which do not have an allocated code will not be imported. In the above example a code Time Location has been set up with values for Landscaping, Clearance, Structures etc. 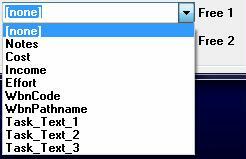 When these codes have been allocated to the relevant Tasks the data is ready for importing into Time Location Plus. The above window will appear. The top list shows all the code libraries in the current project. Highlight the Code Library holding the information on the desired Time Location Type. The Chainage drop down lists the Notes field plus all the UDF's in the project. Highlight the Field holding the chainage information. Free 1 and Free 2 list optional task information that can be imported. This includes all string UDF's. Highlight the desired selections. 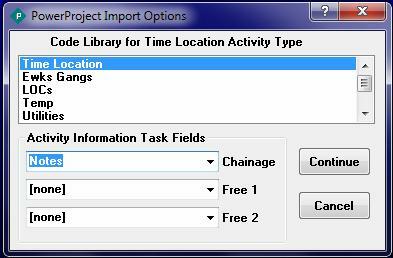 Press Continue to start importing into Time Location Plus, or Cancel to abort the import. The data will then be imported and the Save PowerProject Settings button will appear in the main toolbar.